Nature had a calling to this 1250-square-foot rooftop terrace, a modern L-shaped addition to a 1910 arts and crafts style home located in Lawrence, New York. The design would incorporate beauty, function, and form for a accessible roof area that sits off the master bedroom. The result would screen an unsightly generator and an AC condenser unit, softening the overall geometry, and developing the setting into comfortable living environs for dining and lounging. 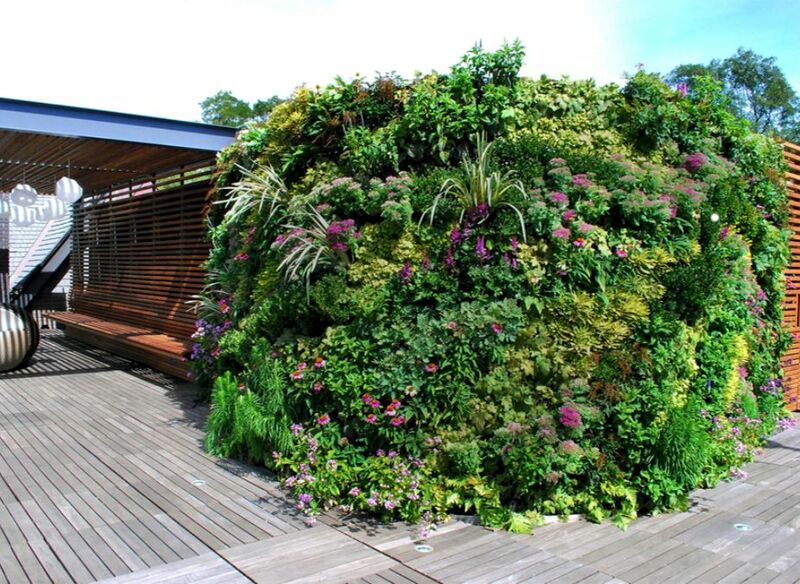 The use of wood throughout and a living greenwall would bring new roof appeal. 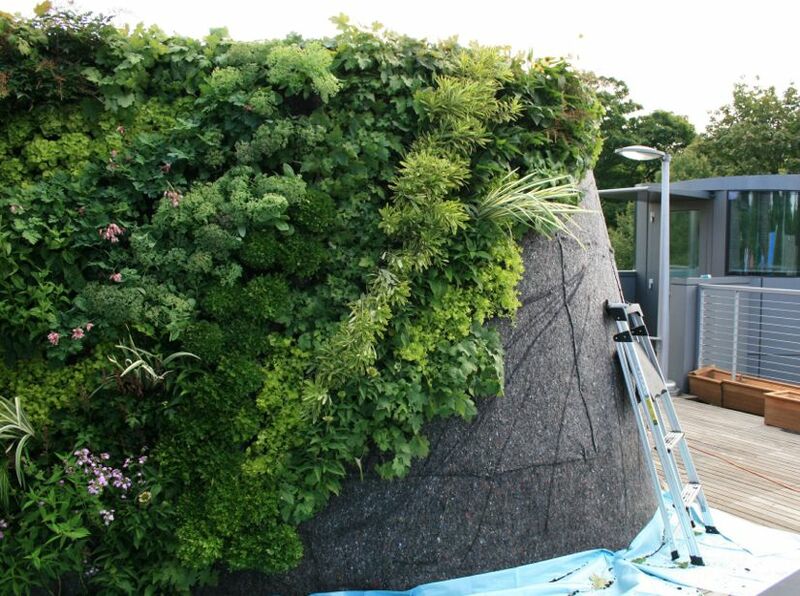 Reinterpreting the American meadow and giving it a verticality, the greenwall incorporates gradients of color, fast growing herbaceous plant material, and all kinds of both native and ornamental species. Groundcovers, blooming perennials, grasses, and mildew resistant climbing varieties would be established along the curved form and uniquely by a diagonal placement, leading the line of sight smoothly around the corner. Perennial planting types for the greenwall are predominantly native, with a few ornamental varieties curated for their color, lasting look by the growing season, and for a low-maintenance solution. Low growing, green foliage varieties and hardy groundcovers remain compact and clustered as individual genera, however in a manifold of diagonal ribbons, a new character and form is exhibited. As diverse textures flourish throughout spring, bright color extends from the varied green backdrop later in the season. Statement varieties including echinacea, astilbes, speedwell, dwarf hibiscus, and coral bells peek out their petals out upon summer, attractive for hummingbirds and butterflies. They can be cut upon maturing to encourage further growth and blooming time, prolonged with a life indoors in floral displays. Shorter sedges and stonecrop, effective in masses, fill in the background. Perennial grass varieties contain blue oat, black mondo, and red fountain which catch the light on the sunnier side of the wall and offer a finer texture in contrast to the other plantings fronds give way and move with the breeze. Denser textures from fern varieties and hostas, thriving in shade, are well situated for the portion of the wall positioned out of direct sun for a great portion of the day. The private Lawrence, NY greenwall serves as a striking focal point alongside consistent language in the architectural formwork, slats of wood running uniformly throughout the entire expanse. Accompanied by a living landscape design of trees and shrubs set along the perimeter, the outdoor sanctuary provides residents with a pleasant new enclave and a solution-oriented design that adds greenery without compromising floor space.